The world of golf is gaining technological steam, from the latest on-glove wearables and virtual putting greens to interactive videos designed to allow instructors to help students without ever having to see them in person. Now, the internet is helping players, both beginners and those who need a touch up on the rules of golf, to gain an education the fun and easy way. I was sent a note last week from a representative of the USGA discussing a new interactive education tool designed to teach The Rules of Golf in a "new" way, by encouraging social sharing and active participation. 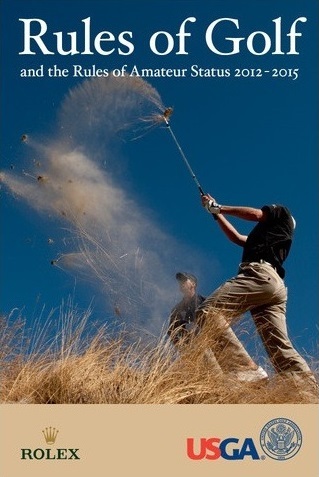 "The Rules of Golf Experience”, is said to be free for everyone (does not require a USGA membership) and is the first of its kind in the wealth of information it provides (a thousand pages of curriculum organized by fifteen subjects, seventy-three lessons and almost two hundred topics). Everything from what to do when your ball rests on the cart path to the difference between yellow and red marker water hazards, are covered in the Rules. The digital experiences are designed to be fun, interactive, rewarding and challenging thus increasing a student's retention and engagement rate, with an average of twenty-minute session lengths). The email also stated that there are guest appearances by top golfers including Jack Nicklaus, Tiger Woods, Justin Rose, Dustin Johnson and Paula Creamer, although I have not yet found any celebrity golf faces. Great Principle #1: You play the course as you find it. Great Principle #2: Put your ball in play at the start of the hole, play only your own ball and do not touch it until you lift it from the hole. 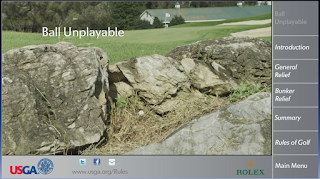 Or, why not watch a video on what to do when your golf ball is unplayable? Brush up on your golf etiquette and knowledge of the game without leaving the comfort of your home and, for times when you are out on the course, keep your handy rules book with you (as I do). Do you think you'll use this new interactive experience? Let us know on our Golf for Beginners blog and on Twitter @Golf4Beginners. The stage is set for drama at The PGA Championship, Whistling Straits, the last official major golf tournament of the season. 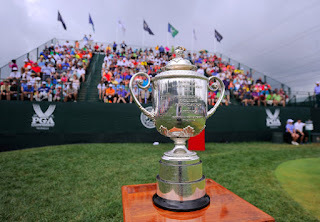 This major could be considered a swan song for several golfers and, quite possibly, the introduction of names that were barely on the lips of fans last year. With this golf blog, let us have a look at a few of the elder statesman of the game, defiantly grasping at glory to hold the Wanamaker Trophy before heading to greener pastures. One more elder statesman on the PGA Tour who is running out of time and luck is David Toms, whose last winning season was four years ago but who has prior experience winning the 2001 PGA Championship. Paired with Vijay Singh in a stellar field that includes Jordan Spieth, Bubba Watson and David Lingmerth, both Toms and Singh have similar odds of winning in the range of 300 to 1. Hard-living, forty-nine-year-old John Daly, considered to be "every-man" and a crowd favorite, has an Open and a PGA Championship in the back pocket of his Loudmouth pants but, according to Examiner.com, his odds of winning are about 500 to 1. 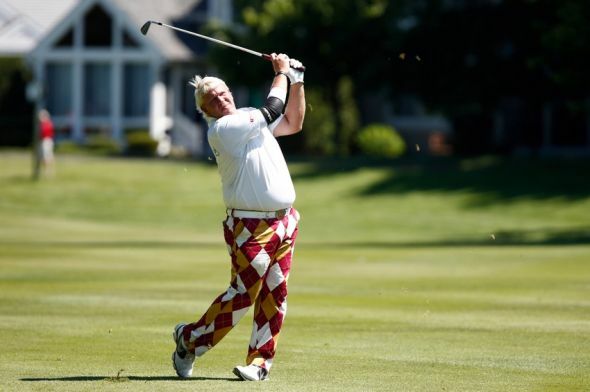 One good thing about watching Daly play is you never know what's going to happen next - #keepingitreal. Okay, so he's not quite ready for the Champions Tour but, at thirty-nine years old, time is ticking away for the former number-one golfer in the world, Tiger Woods. Although Woods has ten years of play ahead of him on the PGA Tour, the question is, are they going to be winning years or more of the same middle-of-the-pack struggles? Although Tiger's odds are now about 30 to 1, he still cannot be counted out. Bleacher Report stated about Woods, "The 14-time major champion hasn't finished in the top-10 of any tournament in which he's entered, and that run includes missed cuts at both the U.S. Open and Open Championship." Any one of these great golfers can win at any time - don't hold their ages or medical issues against them but, with up-and-coming golfers like Jordan Spieth who has won two out of three majors during the 2015 season, it is unlikely that these seasoned players will make a move this week. Which other golfers should probably hang up their spikes or move on in the fairway of life? Voice your opinion on our Golf for Beginners blog and on Twitter @Golf4Beginners. Is #Golf Becoming an Impolite Game? 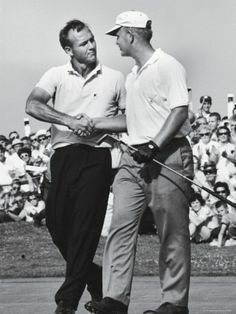 When I watched golf on television for the first time as a youngster, I happened upon two players whom I later found out to be Nicklaus and Palmer - later on I was to learn the significance of "Shell's Wonderful World of Golf". I felt like I was a part of their game; the cameraderie, the etiquette displayed, all made me wonder if women also played this sport. If so, I was going to get in on the action one day. But, being from The Bronx, I also didn't know of any golf courses in my immediate vicinity (now I know better - there are, of course), just the concrete jungle. 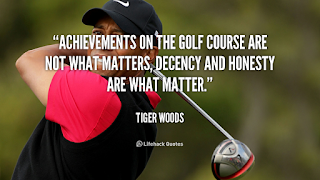 I continued watching, studying the actions of the players, the handshaking, the comments which always complimented another member in the foursome and wondered if other sports had the same standards. Politeness, etiquette, even dressing for the event were all "givens" about thirty years ago but it looks as if some folks believe that this part of the game serves less of a purpose if golf is to survive, and thrive, in our "modern" times. Are we taking one step forward to move two steps back? What is golf etiquette anyway? Well, in my opinion, it's more than just having manners and it's more than just an unwritten set of rules - it's the way the game should be played. Arnold Palmer's tips in Golf Digest include keeping your temper under control and being a silent partner. Here are basic fundamentals of golf etiquette published by PGA.com. Let's also add to our list of etiquette "do's"; keeping pace with the group ahead of yours and not cursing out loud on the course. We have all seen slow play on the PGA Tour - from Kevin Na to Ben Crane and fans have all witnessed foul language after an unpleasant shot...(think Tiger Woods during The Masters) and even spitting on the green (Tiger Woods in Dubai) but the problem with seeing this type of behavior from the pros means it has the ability to trickle right down into the local publinks and to impressionable children watching the sport with the family on a Sunday afternoon. If the PGA Tour pros are going to be seen erring in etiquette, does that mean that it's okay for the average hacker to go ahead and do it? Should golfers have to pass an etiquette test or should we lessen the rules to get more people into the game? As etiquette is an integral part of the game, and, just as in playing the game itself, you have to call infractions upon yourself. If you find yourself cursing, or if you're going to step on a fellow golfer's putting line, it is up to you to stop for a moment and think about common courtesy whether you play nine holes of golf or eighteen, or whether you play on a par-3 or an executive course. Golf is a sport, a game and a heritage all wrapped up in one. Making changes now will certainly impact the future - looking back fifty years, I hope fans continue to see the humility and civility of the game. Voice your opinion on Twitter @Golf4Beginners and on this golf blog.